Starting the week of September 12th, we will begin construction on two pedestrian tunnels. This will allow for the future construction of a second track and platform, and is the first phase of the infrastructure needed for future two-way, all-day service along the Barrie Corridor. There will be impacts that may affect your daily commute. Approximately ninety (90) parking spaces in the Berczy St. lot will be impacted. 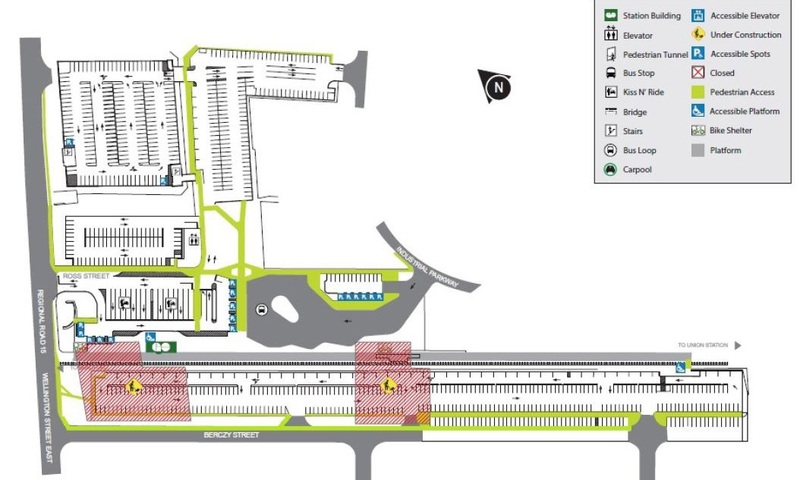 Parking spots will be returned to use once the construction is completed, by mid-2017. We understand that parking is constrained at this station and we have tried to find alternate parking options near the station. Temporary, off-site parking is available at Our Lady of Grace Church, 15347 Yonge Street for those who must drive. Please follow the posted signs to access the station. Aurora customers are encouraged to find alternate means to access the station – whether by using local transit (YRT), carpooling, walking, biking, or getting dropped off at the station. For your ease, we’ve created the Aurora GO Station Travel Guide to help you make smart travel choices to and from your station. We have recently added ten new carpool spaces to the station, and we can always add more if customers inform us the designated spots are full. We’ll also help you find a carpool match, and you’ll find more information on that program here. Once you're matched, click here for information on how to receive a carpool parking permit. York Region has also mapped out the safest routes to cycle to the station, which you can find here. If taking local transit is an option, you can map you can plan your trip to the station here. The significant increase in service can only be delivered by making significant changes to the station. We understand construction can be inconvenient, but we are working hard to get it done as quickly as possible.